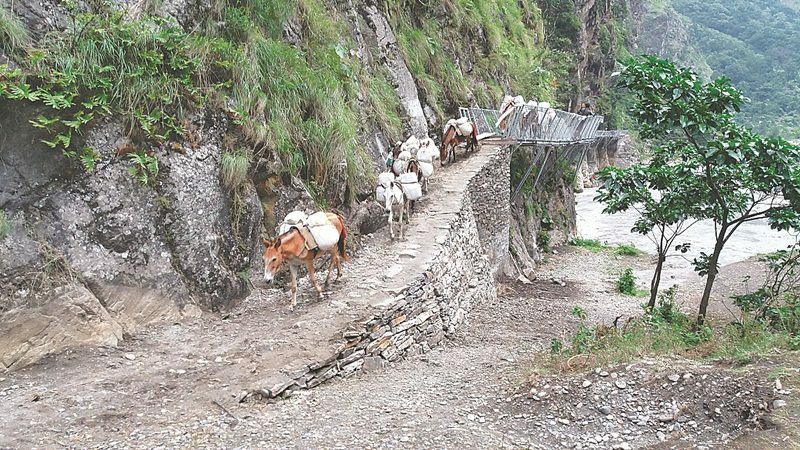 A mule train travel up the Yaru Bagar cantilever bridge. One attraction for trekkers and pilgrims heading to the sacred Tsum valley in northern Gorkha is a cave where Buddhist guru Milarepa is believed to have meditated. With a rich history of art, culture and Tibetan Buddhism, Tsum’s natural beauty has attracted pilgrims and trekkers in hordes. 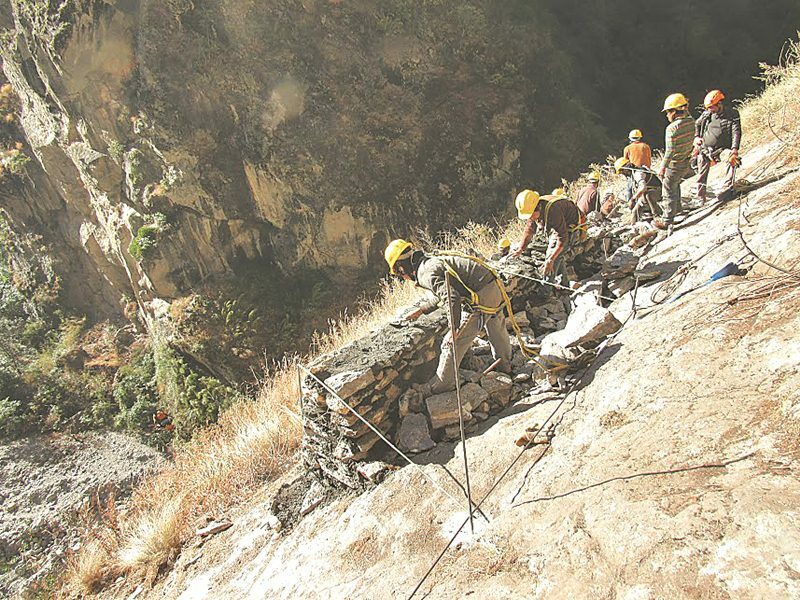 The April 2015 earthquake damaged the only road leading to the Tsum and Nubri valleys. Landslides washed away trails located along the Budi Gandaki River. Cut off from the district headquarters, it wasn’t long before a food and medicine shortage was announced. While the well-to-do hired helicopters to fly in urgent supplies, most villagers had no option but to wait for the road to re-open. The alternative paths required scrambling down steep hillsides. The prices of consumer goods jumped, while local lodges stayed empty. cantilever pathways/bridges has changed the scenario. 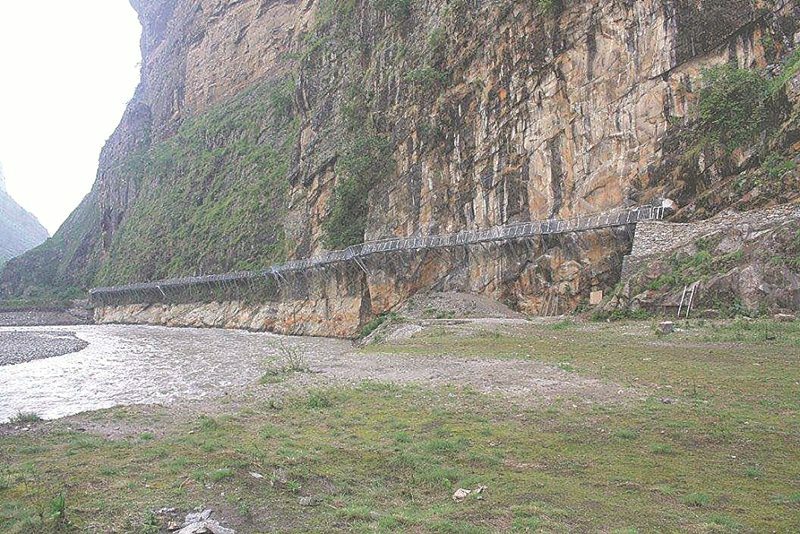 A 117m long pathway along Syar Khola has reconnected Tsum valley to the main road. 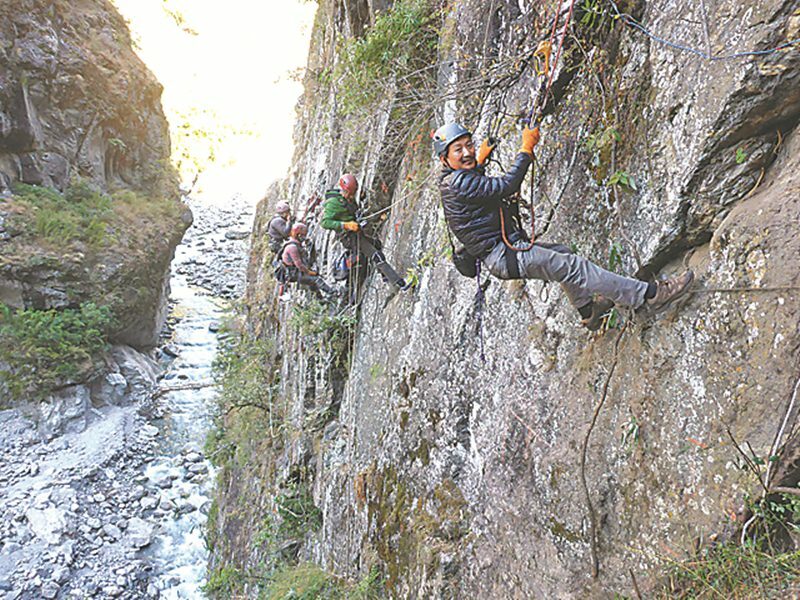 A longer 195m long pathway along Yaru Bagarhas re-opened the popular Manaslu trekking route, which is part of the Great Himalaya Trail (GHT). Built with UK support, both bridges use a unique engineering technology to drill into the cliffs to secure a platform, in a way that is safe from landslides. With this rural infrastructure in place, travel time has shortened significantly, the price of goods has decreased, and reaching schools, markets and hospitals is easier and safer. The construction of the pathways provided jobs to 180 villagers, earning them close to 6.1 million rupees for three months’ work. The project was implemented by the UK aid funded Samarth. 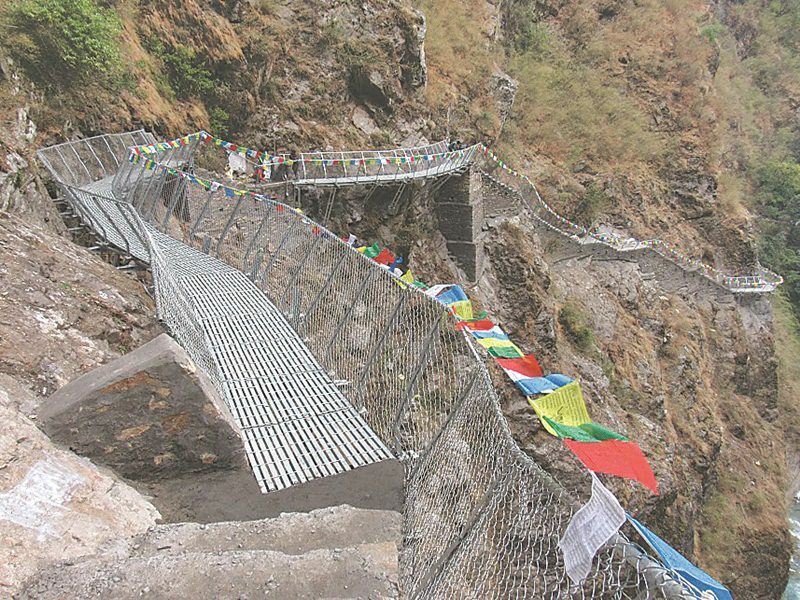 From afar, the pathways are an impressive sight—modern steel structures fixed to sheer cliffs, in some of the most remote areas of the country. As a result, the bridges themselves have become tourist attractions. 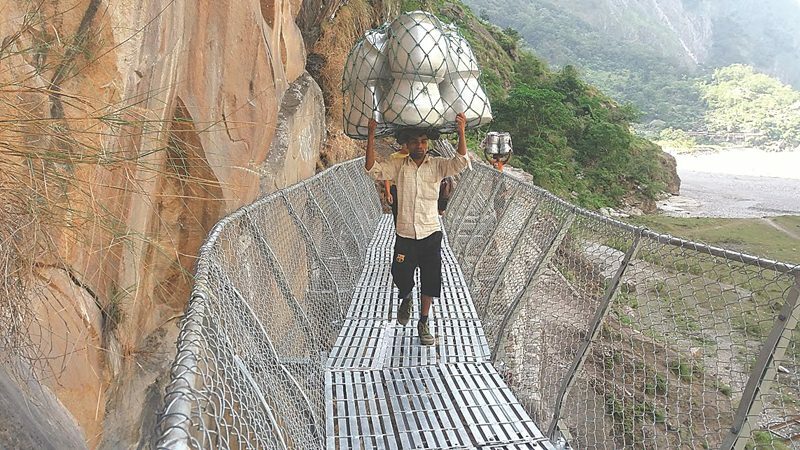 Life is far from normal in these earthquake-ravaged areas, but the bridges have come to be seen as a symbol of hope and progress that is revitalising the local economy. Engineers during the bridge construction. The approach path leading to the Yaru Bagar bridge from Jagat. 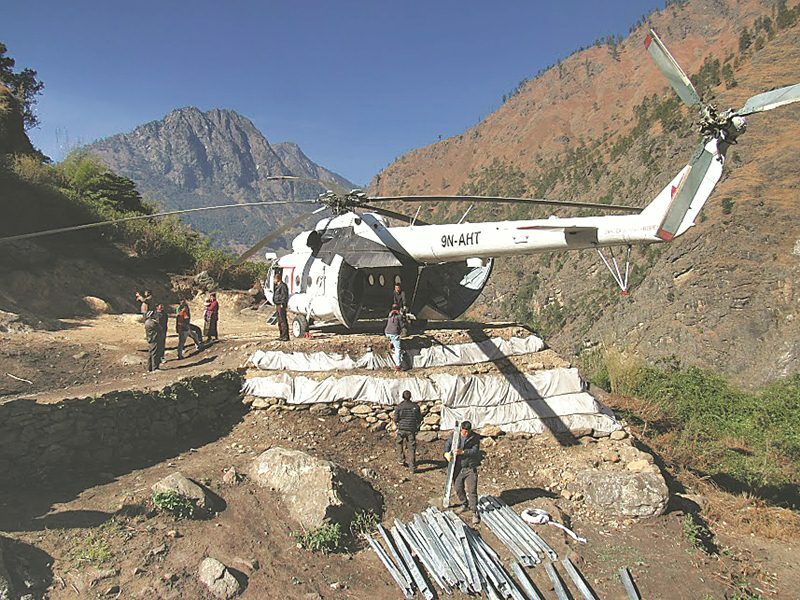 Cargo helicopter landing at a helipad constructed in Lokpa. A view of the bridge from downstream. Local workers at the site of the bridge. 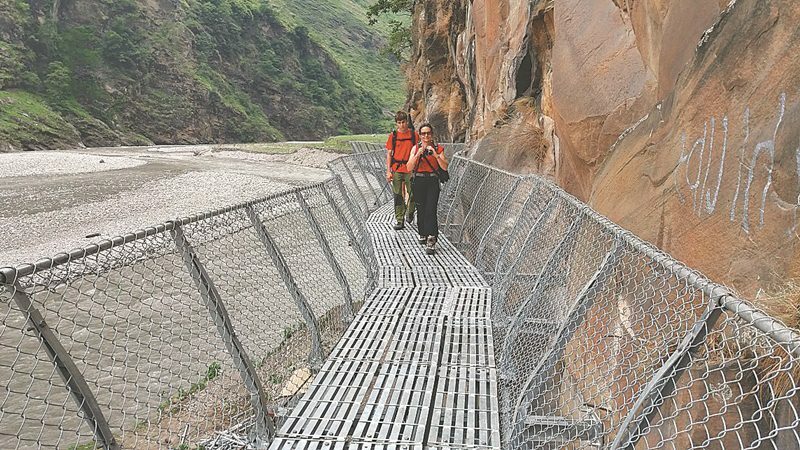 Tourists using the cantilever bridge on the Manaslu circuit. A local woman shows the earnings she made from working on the bridge construction. A view of the cantilever bridge leading to Tsum Valley. A safer way to transport goods up and down the rural hillside.